Young Living Peppermint Oil makes bees buzz off!! Bees are wonderful little creatures. They pollinate our flowers and provide us with delicious honey, but they are not usually welcome guests at our summer picnic. Here is a quick tip to keep these little rascals away. Place a few drops of Young Living 100 % pure peppermint essential oil on your table-cloth or picnic table. Leave the open bottle near your food. Bees will avoid the peppermint and your food. 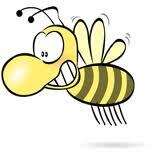 If you do happen to get stung by a bee, a drop or two of Young Living 100 % pure peppermint oil will immediately help to sooth the pain.